I had an epiphany the other day. Well, kind of an epiphany. Let me explain. I was at a local hospital for a CT scan of my sinuses. And I was lying on the sliding-bed-thingie, and the technician was moving it back and forth, as they do. Then she disappeared into the back room, and when she reappeared, she said..."My little machine," I assume she meant her computer. "tells me that you are fifty-nine. Boy, you don't look anywhere near fifty-nine!" Smiling, I calmly swung my feet over the edge of the bed, and said, "Well, thanks very much." But... inside my head, I was shrieking..."I'm fifty-freakin'-nine! When the heck did that happen??!!" I mean, I know literally when it happened; I had a birthday when we were staying in this lovely B&B in Chambon-sur-Cisse, in the Loire Valley last month. But somehow it didn't sink in, that I went to France in my fifties, and returned home almost sixty. Sixty! Six zero. And it started me thinking about those stages in life when you just know that a certain item you've been wearing is no longer appropriate. I mean, you still fit into it (whatever it is) so you can wear it. But should you wear it? I remember clearly, years ago, hauling out my lovely, royal blue, corduroy Laura Ashley dress. And putting it on. And then looking in the mirror and just knowing that the time for that dress had passed. It still fit; it was still in style; I still loved it, but it just did not go with my face anymore. Something about the shape of the dress screamed young. Girly. I could pull it off in my twenties... but those days were gone. Ah well. So be it. I gave that dress away. And so I've been wondering this week about pink. Pink is such a girly colour. And it's everywhere this spring and summer. 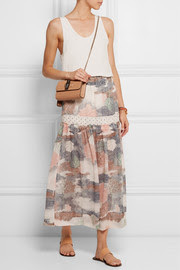 Like these looks from Net-a-porter.com. Beautiful blush pink dresses, and skirts. And hot pink tops and pants. I love them all. Admittedly, I couldn't wear the dresses because that soft, blush pink looks awful on me, and I couldn't keep the strapless one up anyway. 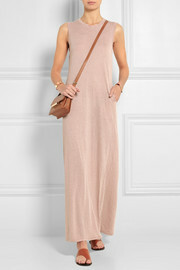 And the column dress, trust me, I tried that look in the 90's... ugggh. But I love that patterned skirt, in those soft shades of pink and grey. And that hot pink, asymmetrical tee shirt is great. As are those pink, pleated dress pants. And so I ask myself... is pink too girly for me now that I'm creeping up on sixty? I don't own a lot of pink clothing. A couple of tee shirts, a sweater or two. And a pair of coral pink jeans from Elie Tahari that I bought three years ago. I love those pink pants. They are slim but not skinny, high-waisted, and cropped just above the ankle. I've worn them so much that they are a bit faded from the wash now. But are they past it? Or more to the point.... am I past it when it comes to wearing pink pants? So I tried on my pink pants with the Rag and Bone layered silk tank that I bought to take to Paris... and which I never wore because the weather was too cool. I love this top. It's age appropriate (whatever that means) and, more importantly, shape appropriate for me: long, with a narrow cut that falls away from the body. I love the high crew neck and the cut-away shoulders. I'd definitely wear this outfit on a summer evening, maybe strolling in the Byward Market, stopping for a glass of wine and dinner at one of the outdoor patios. I think the simplicity of the tank calls for big earrings. These are my cheapie Pier One earrings, brass-coloured with red beads. I like the little bit of bling that they add to an outfit. I'm all for bling.... in small measures. And if it's cooler, I'd wear my Helmut Lang jacket. This is almost the same outfit that I took to Paris. 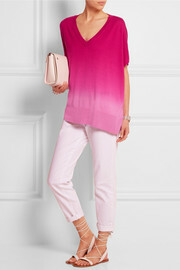 But I think the pink pants and flat sandals are more casual than the white pants and black patent loafers. And you know, there's nothing wrong with this look for a newly turned fifty-nine... creeping up on sixty... year old. 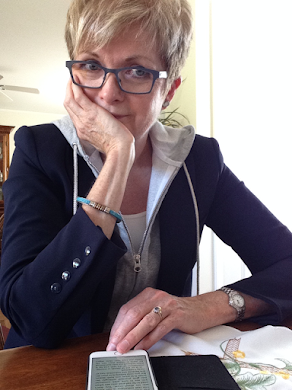 My Helmut Lang jacket is a miracle worker; it packs some serious chic power. I'm so glad I bought it. And so while I was thinking about Paris outfits, I tried my pink pants with my A.L.C. black and white striped tee which I wore all over France, not just in Paris. 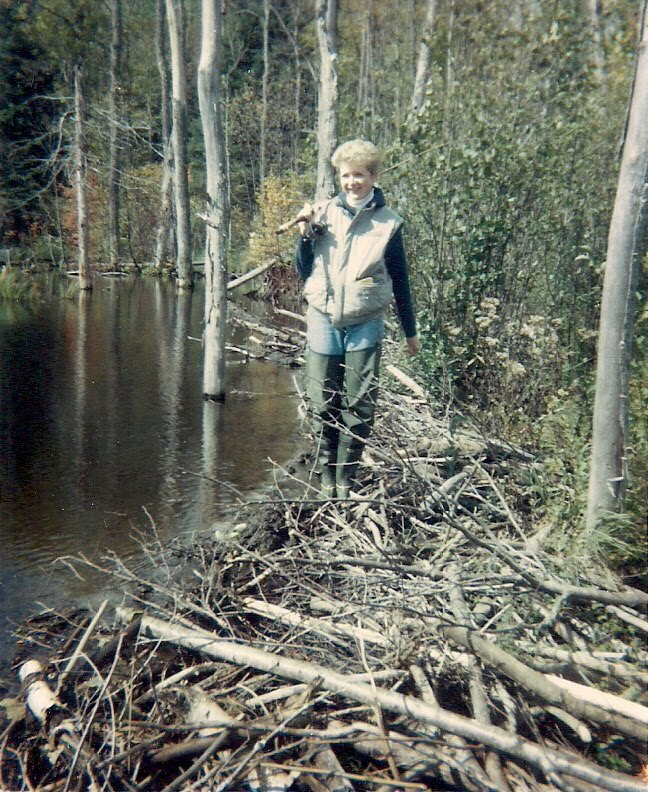 I rolled my pants and slipped on my red-trimmed Stan Smith Adidas sneakers. I like this. The pink pants are a nice change from my blue or white jeans. But as Stacey and Clinton from What Not To Wear would say, I needed a "completer piece." (Don't you miss What Not To Wear?) So, the Helmut Lang Jacket it is. I love black, white, and a colour, in this case, pink. If the pants were pastel pink, this outfit wouldn't work, but the coral is a strong enough shade to offset the black jacket, I think. 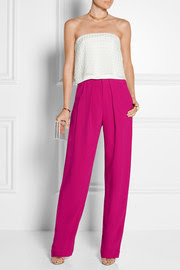 So, in my pink pants, I was off to run errands downtown, and maybe check out the sale at Nordstrom. My friend Liz had e-mailed me that they had a great sale on all week. And so, to answer my own question, at fifty-nine...creeping up on sixty... I don't think I'm past wearing pink pants. But, of course, that depends on the pants doesn't it? Pants that fit properly, and are cut to flatter my shape, are age appropriate no matter what colour they are. Okay... I don't think I could stretch to soft pastel pink, but you get my point. I don't believe that our age means that we arbitrarily shouldn't wear certain things. But I do believe that every so often we need to reassess our fashion choices. And see if what we're wearing reflects who we are now. That's what my epiphany was about, really, as much as the gasping realization that I was one year from sixty. I realized it was time for some reassessment. Time to look at whether some things in my wardrobe (like my pink pants) which still fit, are still in style, and which I can still wear, are what I want to be wearing. Whether my clothes reflect me, and who I am inside... now. That's the important bit. Because, after all...fifty-nine is just a number. And pink is... just a colour. This is the view from my car window as I sat in traffic on my way to Nordstrom last week. It's Ottawa...and summer...and of course there's construction everywhere. Still, there are worse views to look at as one sits and contemplates youth vs age... and rethinks pink. What do you think about pink, dear readers? Do you have any wardrobe no-go areas now that you're the age you are...whatever age that is? Linking up this week with: What I Wore at The Pleated Poppy, Style Me Wednesday at Shopping My Closet, Passion 4 Fashion at Rachel the Hat, Fun Fashion Friday at Fashion Should Be Fun, Casual Friday at Two Thirty-Five Designs, Manic Monday (at More Pieces of Me and On the Daily Express) and Thursday Blog Hop at Over 50, Feeling 40. Thanks Wendy. You don't sound grumpy at all. Scan results next week. I've never cared for pink and don't look good in it. I do love coral and I love your pants. All of your outfits are great - age appropriate and sophisticated. The pants add some punch and personality. I'm a couple of years younger than you and can totally relate to your comment about your face not matching some clothes. I too miss Stacy and Clinton (and don't care for her new show - too theatrical). Great post! I like some shades of pink....others make me look ill. Thanks for the kind comments. Those are great pants, and I think I like pink better on the bottom than the top! Love your looks. Thanks Pam. I like pink under a jacket or sweater, but not often on it's own on the top. My colouring doesn't allow for it! I'm in the same situation as you are - next March I will be sixty. I think there are things that don't work anymore, but as you said, it's more of a know-it-when-you-see-it thing. Exactly....you know when you put something on that it just doesn't work anymore. Thanks for stopping by. I'll do that. And thanks for stopping by. Loved your post...tried to comment but it just disappeared. I love coral pink! As for other shades, it very much depends. However, I do have a pair of pale pink pants which I love to wear with a navy top - I think navy and pale pink are not quite as jarring as pale pink and black. I agree that you very much have to police yourself at this stage in the game - you are doing a marvellous job of that! Thanks, Patricia. I agree, pale pink would look lovely with navy. Thanks Iris. You're right about bare knees. Sometimes "yes" and sometime "meh." And that number thing just shocked me...59! Ackk. You look awesome, as always, and are gorgeous "in the pink." I have aged out of shorts, but I think pink can go on forever. Schiaparelli didn't design for teenagers, after all:). Having just turned 61, I feel your pain! Of course those of us of a certain age can wear pink, as long as the shade flatters our coloring.Your musings about whether we should wear certain items or styles strikes a chord. I've been having similar thoughts recently. Some styles now seem too jejune to really work. Like Anonymous said above, the day comes when you notice that your knees just aren't cute anymore and you probably shouldn't display them. And that's a sad day indeed! Goodbye shorts and a few dresses and skirts.The outfits you put together in this post are fantastic, would work for women of any age, and you look fantastic in them. Happy belated birthday. Why thank-you Beth. I'm currently looking critically at my knees. I've always worn skirts just above the knee....now...hmmmm we'll see. Pink is forever! And you do look amazing, my dear! Thanks for sharing with Fun Fashion Friday! Thanks Dawn. Happy summer vacation, now that school is over. I think you look great in the pink pants but do understand your wariness of pink. As others have commented it depends on how it relates to your skin tone. Personally, I am not a great fan of pink, particularly pale pinks but think the brighter pinks work better with older bodies/skin. As to the knees that's another big issue. On the one hand my knees/legs aren't great but in the hot weather (it was 36C yesterday) then I will wear a short skirt (only wear shorts for gardening) and when feeling desperate for something cool to wear will go out in them as well!! I agree....I think more saturated colours look better on older skin. At least until we're 85 with fluffy white hair...ala Miss Marple. Whew, I am relieved...from the title and intro, I was afraid you were veering off in the direction of pale pink lace collars! I love the pink pants on you. You have great legs for those pants (on me, not so much). You balance it well with the top pieces, too. I think the asymmetric top may look nice on you. Worth a try-on anyway. You do look great for 59 (or 50). Thanks Suz. Never fear....no chance of pink collars, lace or otherwise on me. I might try a top like that asymmetric tee... if the neck were a little higher. There are so many shades of pink and it can be very flattering to certain skin tones...I for one will always find room for pink in my wardrobe and particularly love it with black or if a paler shade of pink paired with a silvery gray. The style of a clothing item really sets whether it is age appropriate rather than focusing on the colour alone. Love the black Helmut Lang jacket...it completes the outfit beautifully! Oh yes...pink and grey are lovely together. Too pale for me...but lovely. Great post! I found your blog just this morning. I'm 55 and think I look older than you. ;) I've never been a pink person mainly for the fact that I like warmer colors on my skin but I do love some shads of purple. I'm currently battling not wanting to wear shorter or sleeveless tops or dresses due to not wanting to show my arms. Your arms are in great shape! I use weights at home but I just don't get results I'd hoped for. Cute pants!! I like all the looks here. Thanks Joni. The fitness and toning battle gets harder and harder doesn't it? Ah yes... I have ruined many light coloured tops with dots of whatever. Pasta is the worst for me...somehow a red sauce always splashes onto my blouse. How do people eat without doing that??! I am 58 and have been dealing with the exact same thoughts for the past couple of years as I transition my style from very boho to more classic with touches of boho. I am always drawn to very boho styles - flowy skirts, lacy, ruffled pastel tops, in stores but when I take them back to the dressing room and put them on they just don't "go" with my face/hair/body style anymore. My new uniform is skinny/narrow pants/jeans with loose tunics and cardigans. I get my boho on with my jewelry choices. As for pink - LOVE and have found that it is best used in accessories - scarves, handbags, jewelry. Your pants are awesome and I totally love the outfits you put together -- they are very classic and sophisticated but not too young at all. Oh, I can so relate to this! I've always been drawn to boho, but it's seeming less and less workable at 62, and I'm increasingly going fairly classic and saving the boho for scarves, jewelry, etc. I've never been a boho person. I love the look on others, but when I try it feel like I'm wearing someone else's clothes. But can definitely embrace the skinny jeans with a loose tunic. And much more boho earrings than I ever wore. Funny that, eh? I'm glad you kept the pink pants--they look great on you! I'm actually rethinking blush pink as it comes back into style. It suits my coloring but just seemed too...dowdy? neutral? for the longest time. Now that I'm seeing it in some fresh designs, though, it's calling my name. Good thing we can always reconsider our self-imposed fashion rules! Yep, you're right about fashion rules. Just when I consider making one....I consider breaking it. The pink pants are perfect (how's that for some inadvertent alliteration? )....bright, not twee but not too in-you-face either. I'm having some serious jacket envy too. Great looks all around! Thanks Sue. Hope you like your new pink pants!